In Winnipeg of Canada in 1960, Randy Bachman with Chad Allan (Allan Kobel) co-founded "Chad Allan & The Silvertones". The members of the group, Gary Peterson, Bob Ashley and Jim Kale, are five devoted young men who know well that this success just didn't happen. The band changed their name to "Chad Allan & the Reflections" and they released their debut single, "Tribute to Buddy Holly," on the Canadian-American label in 1962. From their first show, they worked hard to build a name for themselves. They played at school and community club dances throughout Winnipeg. 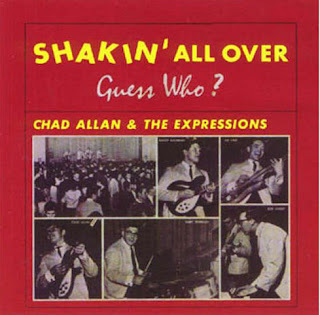 In 1963, the band changed their name to "Chad Allan & the Expressions" after signing with Quality Records and releasing several singles that were minor hits in Canada. In 1965 they released their debut studio album "Shakin' All Over". The album played to the local radio stations without telling them who they were. The anonymous band was dubbed 'The Guess Who' and Canada's first supergroup had been born. These records reaffirmed their success and led to a tour last summer of western Canada. The song "Shakin' All Over" became #1 to Canada, #27 to Australia and #23 to America.